For sale in this listing is DC Comics Presents 47 CGC 9.8 NM/M with White pages published by DC in 1982. 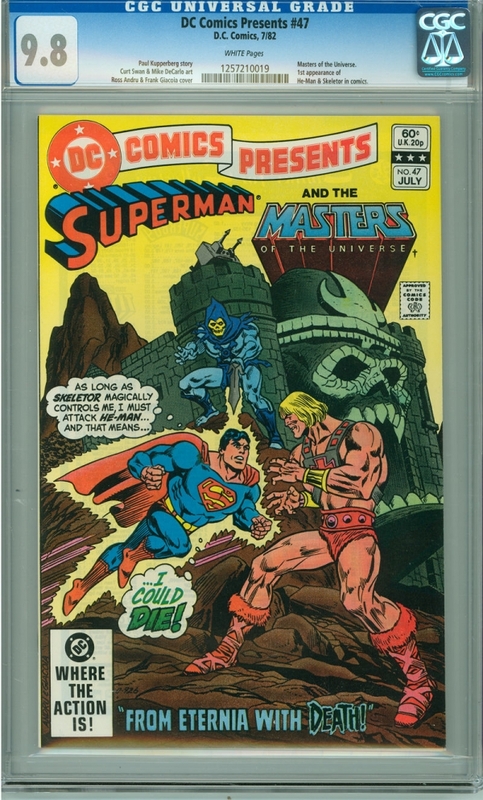 This issue features the first appearance of He-man & Skeletor. Even by 9.8 standards this comic is really nice! Good luck and have fun bidding. If there are any questions please contact me through eBay or by phone at 585-730-8148. For those of you who have never bought from me before, I've been an eBay seller for the past 9 years primarily specializing in high grade Gold and Silver age comics. I try to grade strictly and have a hassle-free return policy (including paying for return shipping). I will always do anything I can to make sure that everyone who buys from me is 100% satisfied with every transaction! NYS residents are required to pay 8.25% sales tax.